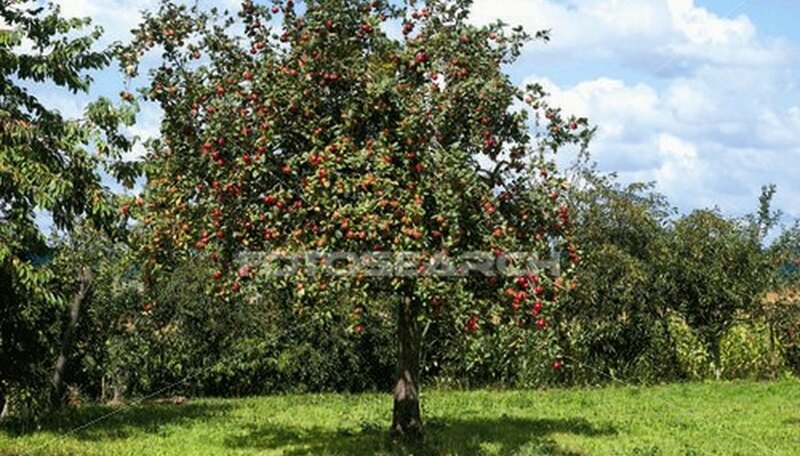 Apple trees provide good tasting, juicy fruit and add visual attraction to any yard. Apple trees come in three sizes: standard size, dwarf and semi-dwarf, so they can be grown in even small yards. Apples come in many shapes, sizes and colors, as well as flavors. Some apples are sweet and some are tart. But one thing they all have in common is proper maintenance requirements. Apple trees need food and water just like any other tree. Use a nitrogen-rich fertilizer with ammonium sulfate around the base of your apple trees. Spread 1 cup of the nitrogen-rich fertilizer around the base of the apple tree two feet out, but six inches away from the trunk. Rake the fertilizer evenly into the soil. If the first fertilizer application is done in the spring, repeat three months later. Apply the same fertilizer to a three-foot circle around the apple tree after the tree is two years old. Avoid the trunk of the tree by spreading the fertilizer evenly over the circular area starting six inches away from the base. Repeat the same application in the following three months. If the first application was spread in March, repeat the application in April, May and June. Follow the same fertilizing procedure in the third year, using two cups instead of one. Do this again in the fourth year, using three cups instead of two. Fertilize your apple trees once each year in the spring. Fertilize your apple trees with the amount of fertilizer required for the age of the tree. The first year the apple tree requires 1/2 pound of fertilizer. For each additional year add another 1/2 pound. If the apple tree is not producing a good crop of fruit, cut down the amount of fertilizer. What Does an Apple Tree Look Like in the Summer?